Propofol is today considered the most common intravenous drug for the induction of general anesthesia. The onset of action and fast recovery has caused to be introduced as the most common intravenous anesthetic to start and continue anesthesia. Propofol is the drug with Phenol structure whose common complication is pain at the injection site as well as low blood pressure. It seems that its high solubility in fat causes pain induced by intravenous injection. To reduce the pain from the propofol injection with long-chain triglyceride, medium-chain triglyceride, and longer-chain triglyceride have been used. Propofol causes pain through the local irritation immediately after intravenous injection. The intravenous injection of propofol causes pain after 15 s through the activation of Kallikrein and Bradykinin. In some studies, the incidence of pain on the injection of propofol has been cited 28%–90% and about 85% in other studies. Pain intensity of propofol injection has been measured 5.6 ± 3.2 including severe pain based on visual index score in which from 0 to 10 has been scored. To reduce the pain associated with the injection of propofol, various techniques with different results have been applied including cooling propofol, diluting the injected solution, using great antecubital vein, and using topical nitroglycerin and lidocaine. Among from other drugs used for pain relief from the injection of propofol, are anti-inflammatory nonsteroidal drugs, metoclopramide, narcotic drugs, and ketamine and magnesium sulfate. Granisetron is also an irreversible 5-hydroxytryptamine 3 (5-HT3) receptor antagonist with more selective property compared to ondansetron. In the previous studies, the numbness of subcutaneous injection site of ondansetron which is a (5-HT3) receptor antagonist has been proven, and it has successfully been used to reduce and eliminate the intravenous propofol pain without any side complication in patients. Dexamethasone is used to reduce postoperative pain, nausea and vomiting, and granisetron to prevent and treat nausea and vomiting in medical research and training hospitals. In this study, the effect of these two drugs on the intravenous propofol pain was examined in the uterine biopsy in the operating room in Kawther Hospital in Shahid Motahari Hospital. This is a double-blind, randomized clinical trial study carried out after the approval of university ethics committee and satisfaction of patients in Kawther Operating Room in Shahid Motahari Hospital. This research has been registered in www.irct.ir with the code of IRCT2017040427677 N6. The study and its method were explained for 227 patients aged 20–50 years with class 1 and 2 based on the American Society of Anesthesiologists participated in the study. The exclusion criteria included patients with the history of allergy to propofol or 5-HT3 receptor antagonists, patients taken any medication for analgesia or sedation in the past 24 h, severe mental disorder, neuromuscular disease heart disease, uncontrolled high blood pressure, kidney and liver disease, seizures, body mass index (BMI) over 30, chronic use of any drug, the history of allergy to dexamethasone, digestive disorders, history of osteoporosis, hormonal abnormalities such as hirsutism and menstrual disorder, and history of diabetes. All patients were fasting for 8 h before surgery. After admitting patients in the operating room, intravenous line No. 20 was embedded on the back of nondominant hand and lactated Ringer serum was injected. Standard monitoring including noninvasive blood pressure, pulse oximetry, and electrocardiogram was connected to the patient. The patients were randomly divided into each of three groups receiving dexamethasone (0.15 mg/kg of) (Tehran chemistry) and Granisetron (1 mg) (Tehran chemistry). Each drug was prepared in syringes 5 ml by anesthesia technician, and the anesthesiologist was unaware of its content. The patients were selected for the injection of each drug based on random numbers table. All the drugs were maintained at the room temperature (21°C–23°C). Sixty seconds before the injection propofol, dexamethasone (77 patients), granisetron (73 patients), and placebo (77 patients) drugs were injected and the venous drainage was prevented by resident. Venous drainage released 1 min after injection. One-fourth of propofol required for anesthesia which is 2.5 mg/kg was injected at the speed of 4 mg/s. Then, an anesthesiologist who was unaware of the type of drug, examined incidence and the pain score with visual analog scale and pain intensity through scoring a conversation with the patient during the injection in a way that zero = no pain = no answer to the question; one = moderate pain = report of pain only in the response to question with no behavioral response; two = moderate pain = report of only in the response to question with behavioral response or report of spontaneous pain without question from patients and three = severe pain = severe audio reaction with severe frown, pulling hand or tearing). Then, to start the anesthesia, after propofol, fentanyl 2 μg/kg was injected and the patient was ventilated through an oxygen mask during surgery. Vital signs were measured and recorded before the injection of propofol and 1, 3, 5, and 10 min later. This randomized double-blind prospective clinical study was carried out on 227 individuals among from the patients who underwent the biopsy of uterus in Shahid Motahari Hospital and randomly divided into three groups: dexamethasone, granisetron, and placebo. The mean age of BMI showed no significant difference in all three groups (P = 0.84) (P = 0.61) [Table 1]. According to the results of this study, 38 (49.4%) patients, 37 (50.7%) cases, and 68 (88.3%) ones had pain in dexamethasone, granisetron, and placebo groups, respectively, which shows that there was a significant difference among the three studied groups in terms of pain (P = 0.001) [Table 2]. The mean of pain score was 2.73 ± 1.03 in the dexamethasone group, 3.16 ± 1.23 in the granisetron group and 4.82 ± 1.73 in the placebo group. 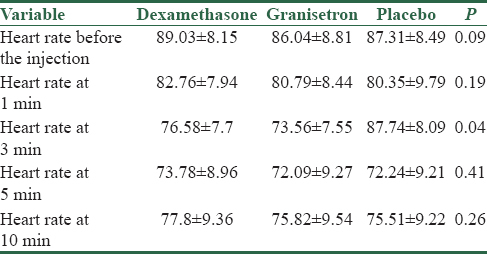 There is a significant difference between the three groups and the amount of pain score according to ANOVA test which indicated that there is no significant difference between dexamethasone and granisetron groups in pain score with P = 0.80 while the difference was significant in comparison of dexamethasone with placebo groups and there is also a significant difference in the granisetron [Table 3]. According to the [Table 3], there is a significant difference in intensity of pain injection between three groups (P = 0.001). Pain intensity was higher in the placebo group and was significant statistically. ANOVA test showed that there was no significant difference between the mean blood pressure before and after injection and at 1, 3, 5, and 10 min after injection among the three groups [Table 4]. According to ANOVA test, the mean heart rate in the three groups had no significant difference at other times with each other except for at 3 min when the mean heart rate was lower in the group receiving granisetron. This difference was statistically significant (P = 0.04) [Table 5]. On the mean O2 Sat before and at 1, 3, 5, and 10 min after injection according to ANOVA test, no statistical difference was observed among the three groups, and [Table 6] confirms this issue. This prospective randomized, double-blind study was carried out over a period of 9 months in Kawther Operation Room in Shahid Motahari Hospital. 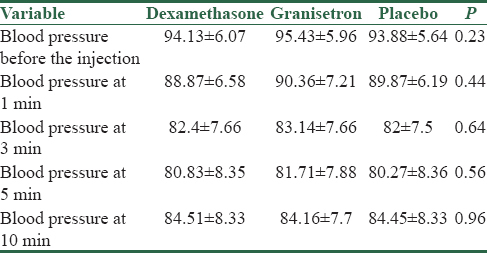 The results of this study revealed that pretreatment with dexamethasone and granisetron can be effective on the incidence and intensity of pain caused by the injection of intravenous propofol and reducing it from 88% to 50% in the placebo group in the granisetron and dexamethasone groups. Pain score and intensity had also a statistically significant difference between the intervened and placebo groups. Meanwhile, no statistical difference was observed among the three groups on the parameters measured at different times, i.e., mean blood pressure, heart rate, and arterial oxygen percentage. It seems that the prevention of painful irritation caused by propofol injection is necessary and important because it causes discomfort for patient and hemodynamic changes in response to pain by irritation can lead to myocardial ischemia in high-risk patients. Studies have shown that the mechanism of painful irritations by intravenous injection of propofol had several factors and propofol in the injected site releases NO. Nerve endings sensitive to NO which cause painful irritations are well known in human veins. In addition, NO produced by vascular endothelium leading to guanylate cyclase catalyzes the conversion of guanosine triphosphate to guanosine monophosphate which in turn, catalyzes the production of prostaglandin E2 causing hyperalgesia. Dexamethasone can be effective in reducing the incidence of pain by propofol injection. The results of the previous studies have shown that ondansetron can reduce the pain caused by the injection of propofol in several ways including blocking sodium channels, antagonizing 5HT3 receiver, and the stimulating effect μ receiver. We used granisetron on the assumption that granisetron acts more selectively on 5HT3 receivers compared to ondansetron. In 2012, Ahmed et al. examined the prophylactic effect of intravenous granisetron on the pain caused by the injection of propofol and found that the incidence and intensity of pain were significantly lower in patients receiving granisetron. This finding is consistent with what we achieved in our study. Ahmad et al. compared the effect of dexamethasone and intravenous lidocaine on intravenous propofol pain along with saline. The results of the present study indicated the effect of dexamethasone on reducing the pain by intravenous injection of propofol; however, we used lower doses of dexamethasone. In Iran, Alipour et al. examined the effect of paracetamol, ondansetron, granisetron, magnesium sulfate, and lidocaine on intravenous propofol pain and found that granisetron is effective in reducing the pain which is consistent with the results of our results and they used 2 mg of granisetron in their study. In 2012, Zahedi et al., a study to evaluate the effect of pretreatment on reducing the pain by the injection of propofol. The first group received 50 mg tramadol, the second one 4 mg ondansetron in 2 ml normal saline and the third group 2 ml normal saline. The effect of ondansetron on reducing the pain caused by propofol had no much difference with that of tramadol. Granisetron has been used in our study, and since we assumed that the drug is more selective than ondansetron, it was effective not only to prevent postoperative nausea and vomiting but also to reduce the pain by the intravenous injection of propofol. Granisetron is used for the prevention of postoperative nausea and vomiting during the induction of anesthesia. The study confirmed the effect of granisetron on the intravenous propofol pain. The results of the study indicated that the prevalence of pain reached from 88% to 50% in patients so that in the previous studies, it was also less than this amount; however, the additional doses have been used compared to what we used in our study. However, this property of granisetron was not observed in all patients. Further studies with more patients and more diverse drug doses are needed for the final confirmation of this effect. Gupta S, Ravalia A, Jonnada HR. Pain on injection with propofol. Anaesthesia 2001;56:1016. Wong WH, Cheong KF. Role of tramadol in reducing pain on propofol injection. Singapore Med J 2001;42:193-5. Morton NS, Johnston G, White M, Marsh BJ. Propofol in pediatric anesthesia. Pediatr Anesth 1992;2:89-97. Haugen RD, Vaghadia H, Waters T, Merrick PM. Thiopentone pretreatment for propofol injection pain in ambulatory patients. Can J Anaesth 1995;42:1108-12. Picard P, Tramèr MR. Prevention of pain on injection with propofol: A quantitative systematic review. Anesth Analg 2000;90:963-9. El-Radaideh KM. Effect of pretreatment with lidocaine, intravenous paracetamol and lidocaine-fentanyl on propofol injection pain. Comparative study. Rev Bras Anestesiol 2007;57:32-8. Movafegh A. A comparison of metoclopramide and lidocaine for preventing pain on injection of propofol. Tehran Univ Med J 2003;61:274-80. Pang WW, Mok MS, Huang S, Hwang MH. The analgesic effect of fentanyl, morphine, meperidine, and lidocaine in the peripheral veins: A comparative study. Anesth Analg 1998;86:382-6. Honarmand A, Safavi M. Magnesium sulphate pretreatment to alleviate pain on propofol injection: A comparison with ketamine or lidocaine. Acute Pain 2008;10:23-9. De Oliveira GS Jr., Castro-Alves LJ, Ahmad S, Kendall MC, McCarthy RJ. Dexamethasone to prevent postoperative nausea and vomiting: An updated meta-analysis of randomized controlled trials. Anesth Analg 2013;116:58-74. De Oliveira GS Jr., Ahmad S, Fitzgerald PC, Marcus RJ, Altman CS, Panjwani AS, et al. Dose ranging study on the effect of preoperative dexamethasone on postoperative quality of recovery and opioid consumption after ambulatory gynaecological surgery. Br J Anaesth 2011;107:362-71. Park WK, Lynch C 3rd, Johns RA. Effects of propofol and thiopental in isolated rat aorta and pulmonary artery. Anesthesiology 1992;77:956-63. Moreno L, Martínez-Cuesta MA, Muedra V, Beltrán B, Esplugues J. Role of the endothelium in the relaxation induced by propofol and thiopental in isolated arteries from man. J Pharm Pharmacol 1997;49:430-2. Kindgen-Milles D, Arndt JO. Nitric oxide as a chemical link in the generation of pain from veins in humans. Pain 1996;64:139-42. Kharitonov SA, Yates DH, Barnes PJ. Inhaled glucocorticoids decrease nitric oxide in exhaled air of asthmatic patients. Am J Respir Crit Care Med 1996;153:454-7. Grabowski PS, Macpherson H, Ralston SH. Nitric oxide production in cells derived from the human joint. Br J Rheumatol 1996;35:207-12. Wilson AJ, Diemunsch P, Lindeque BG, Scheinin H, Helbo-Hansen HS, Kroeks MV, et al. Single-dose I.V. Granisetron in the prevention of postoperative nausea and vomiting. Br J Anaesth 1996;76:515-8. Ye JH, Mui WC, Ren J, Hunt TE, Wu WH, Zbuzek VK, et al. Ondansetron exhibits the properties of a local anesthetic. Anesth Analg 1997;85:1116-21. Morishima T, Sobue K, Arima H, Tanaka S, So M, Ando H, et al. Profound pain due to propofol injection triggered myocardial ischemia in a patient with a suspected pheochromocytoma. Anesth Analg 2003;96:631. Ahmed A, Sengupta S, Das T, Rudra A, Iqbal A. Pre-treatment with intravenous granisetron to alleviate pain on propofol injection: A double-blind, randomized, controlled trial. Indian J Anaesth 2012;56:135-8. Petros AJ, Bogle RG, Pearson JD. Propofol stimulates nitric oxide release from cultured porcine aortic endothelial cells. Br J Pharmacol 1993;109:6-7. Gragasin FS, Bourque SL, Davidge ST. Propofol increases vascular relaxation in aging rats chronically treated with the angiotensin-converting enzyme inhibitor captopril. Anesth Analg 2013;116:775-83. Romero TR, Galdino GS, Silva GC, Resende LC, Perez AC, Côrtes SF, et al. Ketamine activates the L-arginine/Nitric oxide/cyclic guanosine monophosphate pathway to induce peripheral antinociception in rats. Anesth Analg 2011;113:1254-9. Holt R, Rask P, Coulthard KP, Sinclair M, Roberts G, Van Der Walt J, et al. Tropisetron plus dexamethasone is more effective than tropisetron alone for the prevention of postoperative nausea and vomiting in children undergoing tonsillectomy. Paediatr Anaesth 2000;10:181-8. Gregory RE, Ettinger DS. 5-HT3 receptor antagonists for the prevention of chemotherapy-induced nausea and vomiting. A comparison of their pharmacology and clinical efficacy. Drugs 1998;55:173-89. Ahmad S, De Oliveira GS Jr., Fitzgerald PC, McCarthy RJ. The effect of intravenous dexamethasone and lidocaine on propofol-induced vascular pain: A randomized double-blinded placebo-controlled trial. Pain Res Treat 2013;2013:734531. Alipour M, Tabari M, Alipour M. Paracetamol, ondansetron, granisetron, magnesium sulfate and lidocaine and reduced propofol injection pain. Iran Red Crescent Med J 2014;16:e16086. Zahedi H, Maleki A, Rostami G. Ondansetron pretreatment reduces pain on injection of propofol. Acta Med Iran 2012;50:239-43.